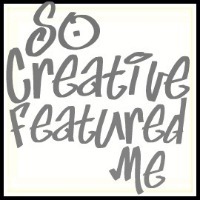 Wow, I’ve been featured again!! This time at Make it Monday by Brassy Apple. My African Flower Tutorial was the most viewed project this week! Thanks, Megan! I live in the Netherlands and there people celebrate the birthday of the queen. And the queen’s birthday is today. Well, actually it’s not her birthday, but the birthday of her mother and predecessor, who’s passed away a couple of years ago. Because the present queen is born in January (she celebrated her 74th birthday this year; oldest head of state ever in this country) and people here like to party outside, they still celebrate Q-day on the 30th of April. Chance of good weather will be more likely, that’s why. WANTED I really like green! 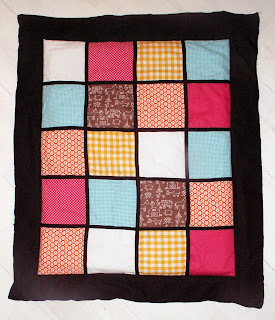 The play mat that should match the liquorice allsorts baby blanket is finished and I’m quite happy with the result. I wasn’t sure about the colors, but in combination with the black it turned out really good, I think. Here together with the baby blanket. For a TUTORIAL look here. For other examples of this play mat look here and here. an edge around it and then it’s finished. (for previous post look here) The panels are connected and form the front side of the mat. Have to cut edges and a back side now. For the finished project look here. For the tutorial look here. 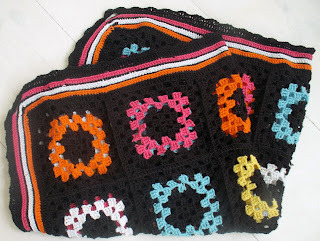 New Grannies Although I love to crochet grannies, I can’t bring forth a complete blanket. Too boring, doing the same granny over and over again. So now I’m trying this: crochet one different granny each day, until I have enough to form a complete blanket. Maybe that works for me. Who knows, I can show you a REALLY LARGE blanket in time. Hibiscus Hair Flowers by Miss Candyfloss WANTED I really NEED this flowers! They bring back sweet memories of my trip to Hawaii and match perfectly with my clothes! 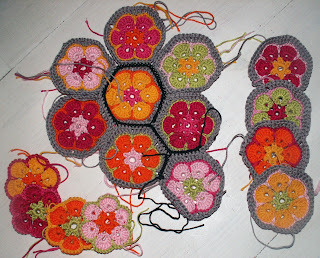 on how to crochet the flowers. You can find it here. Fences like this can be found anywhere on the island. They're made of split branches of pine-trees. I did it! Finally I finished a blanket!!! It’s a little one, that’s true, but large enough. For now I’m done with projects like this. Takes forever. After making this poncho I only felt resistance and swore to myself never to begin another project involving more than twelve grannies, but when a good friend asked me to make her soon to be born son a little blanket, I couldn’t say no, of course. But I’m sooo glad it’s finished now. Awaiting some black fabric for the backside, I already cut the front side panels for a matching play mat (like this one, but with the colors of English liquorice allsorts). At the request of one of my readers I will write a tutorial for the play mat after it’s finished, so if you’re interested than visit my blog now and then (or become a follower J). Yesterday I went to the market and found flowers in my favorite flower color again: orange! WANTED I love the gingham details on this dress! My Happy Flower is featured!!! First time I’ve been featured! 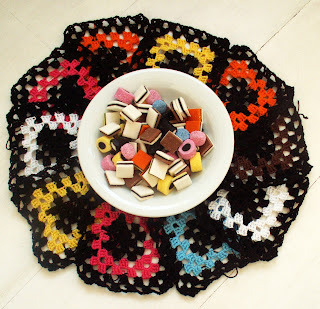 And because I perceive a sort of happiness during the project of crocheting grannies by changing colors now and then (recognizable for anyone? ), I’m making another pillow cover. Different colors, different pattern, though. You can find a tutorial for the flowers here. While working on the granny blanket I started to get bored to do the same granny over and over again, so to do something different for a couple of days I made these decorations for my daughters. This flower I found at a blog called Attic 24. It’s called a Happy Flower and comes with a tutorial! This cuckoo clock I found at a blog called LutjeHaakt. This one is without a tutorial. Both such nice ideas, don’t you think? 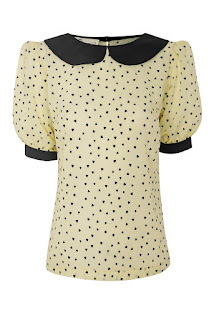 WANTED Adorable blouse, don’t you think? 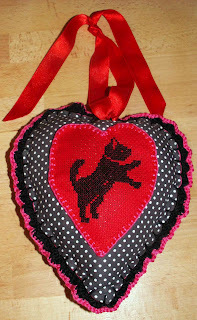 Another Black Cat Project: I made this little heart, for which I found inspiration at the blog of Dutch Sisters again (by the way: they're having a GIVE AWAY at the moment). At first I embroidered the cat on red cheesecloth. The pattern of the cat I found here. Actually it's a pattern for filet crochet, but you can easily convert it into a pattern for embroidering. From fabric that was left over from one of my playmats, I made the heart and decorated it with a crochet scalloped edge. 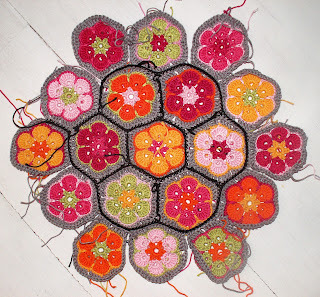 This weekend I made a start with the grannies for a little blanket. It's for a friend of mine who’s expecting a baby boy. 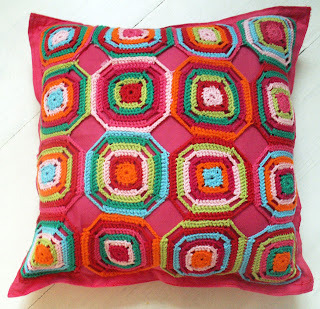 The inspiration for the colours I use for the blanket I found in a bag of English liquorice allsorts. Psycho – still so very scary, even though this movie is more than fifty years old! Maybe it’s because the movie is inspired by a true story (the gruesome story of Ed Gein) what makes it so frightening. And I LOVE the dresses that Janet Leigh is wearing in the movie!